Try the Okra Chips. You might love them but beware.... They can pierce the roof of your mouth. Ha! I'd probably have to buy a container of them. At least they're not heavy. I'm pretty sure that I have mentioned that I really like Dave's Coffee's coffee syrup, before. Well, I finally decided to break down and order some of their craft roasted coffee and I have to say it is truly excellent stuff! The medium roast "Quonnie" is an awesome coffee. It has gone on to replace our usual Gevalia brands. This is some of the best of the Rhode Island offerings out there. Well worth the cost, (but you can save a bit of money with a subscription). Community coffee, Blue Plate mayonnaise, Flonase allergy spray, Weber grills, Diet Dr Pepper, Stanley's BBQ sauce, Blue Runner canned New Orleans style red beans, Iphone 7plus, Skechers shoes with the gel insoles. Many more that I will seek out that brand and won't settle for others. Speaking of coffee, I love my Nespresso machine but for a cup of coffee made with a K-Cup the Tall, Dark and Handsome from Intelligent Brands makes a good, strong, rich cup of coffee. I also bought their single use K-Cup coffee maker. Don't know if it's the reason the coffee is so good or the coffee, itself. First saw it in a Hotel and ordered one that day it was so good. The brewer is tiny and it takes 3 minutes to brew a cup which when waiting seems like an eternity. It's small enough I can take it with me when I travel. MUCH smaller than the single serve Keurig brewer and it was only $39! About a week or so ago I finished the last of the six 16 oz. bottles of Scotts Barbecue Sauce that we, living near Dallas, have ordered directly from Scott's in Goldsboro, NC every other year or so. That usually runs $8/bottle including shipping. Before I re-ordered I checked alternative availability and, (Heavenly Days! ), Wal-Mart carries it on-line with 'free' pickup at my nearest Wal-Mart for $1.98. While I was at it I checked for my no-longer-locally-available favorite hamburger topping, Mezetta's Sweet Bell Pepper Relish and, sure enough! Pressing my luck I tried Heinz Hamburger Relish, Lemon Blennd, Vernor's, and a few other reginal favorites, but 'no dice'. Anyways, a jar of Mezetta's and 2 bottles of Scott's came to $5.97 and 'made my day'! I pick it up Thursday. Since most of us have moved around a bit, are there any among you who have tried this 'method' of getting 'hometown' favorites that are not locally available? BTW: before anyone orders some Scott's thinking it is some variant of K.C. Masterpiece, know that it most definitely is NOT. It is a tangy, bordering on hot, vinegar/pepper sauce that is fantastic (to my taste) on any white meat - pork, chicken, fish, shellfish. I take a bit of it to BBQ places here in Texas where I use it to flavor the bland pulled pork they serve here. I tell the server to 'hold' their (sweet, slimy, nasty, ketchupy) dreck sauce. If you like pulled pork, your first such use is guaranteed to be an OMG 'moment'. It is also a stunningly good marinade for white meats. Here's a great meal that Mrs. Metro 'invented': marinate chicken breasts in Scott's Sauce overnight. Par-fry the breasts, then dice into cubes. Reduce some Scott's Sauce in the man, then finish cooking the chicken. Put the chicken over some steamed asparagus, top with pepper jack, and a short broil to melt the cheese. Serve with a heated baguette. FANTASTIC! Thank her! Over the years, I go through spells of being plagued by very painful cramps in my abdominal muscles. Short of prescribing medication with side-effects my internist recommends potassium/magnesium mineral supplements which I take daily. But, I still get those painful cramps occasionally. I can feel them 'coming' - sometimes after a cough, sometimes after an unusual reach or movement - and when I do I run for my vibrating heating pad and steel myself for ten minutes or so of agony. After seeing so many Theraworx commercials I thought "what the Hell; it's only $17". To my amazement, it actually "workx!" Even though they advertise it as a prophylactic to prevent leg and foot cramps I find that it "worx" when I sense a cramp coming on anywhere on my body. I bought two more bottles, one for upstairs and one for the car! Great stuff that worx for me. EDIT: I forgot to mention that it can be purchased at Wal-Mart, CVS, Walgreen's, Rite Aid, etc. And, if you don't like it, take it back for a full refund. Interesting! I buy Cramp Defense 6 bottles at a time. They also work.... 90% of the time. Those cramps are absolute, horrendous pain! If I don't take them (Magnesium Malate) I get the cramps almost every night... from my toes up in to my thighs and also my fingers. You could die until the pain subsides. I also at the same time use Hyland's sublingual cramp pills and a couple different topicals along with a mouth spray that you use when the cramps hit. You might say I'm paranoid or a hypochondriac but no.... THEY HURT LIKE HELL! But with the Cramp Defense I get them just a few times a month. I tried the potassium supplements along with Turmeric which is high in potassium and because I'm a kidney patient my levels went hospital visit high. Luckily they subsided when I found out and stopped the supplements. 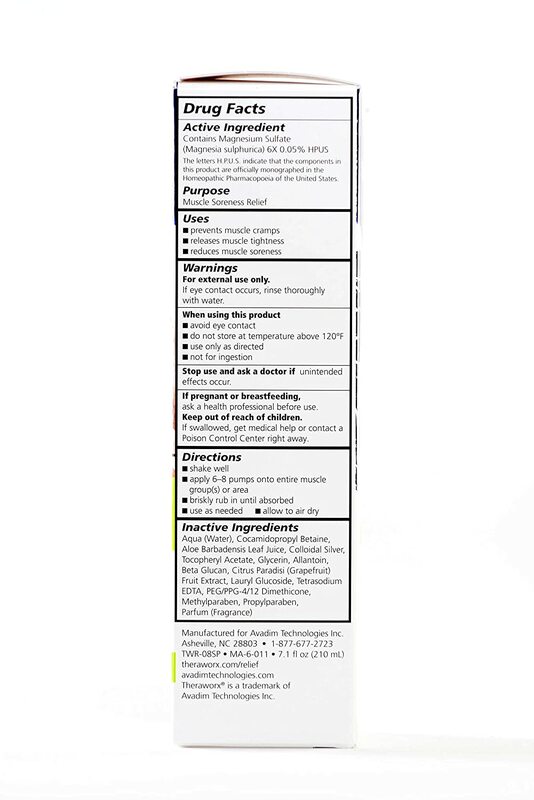 What are the ingredients in the Theraworx? I don't see them on the website. THANKS!!! The active ingredient is magnesium sulfate; in addition, it has colloidal silver, citrus grapefruit extract, aloe, allantoin and vitamin E.
But, here's the best part for me, even if a cramp has developed I rub this foam over it and it literally 'melts away'. As a cramp preventative I use Decontractyl which I buy over-the-counter at pharmacies in Paris. You can also order it online. It does seem to reduce the frequency of cramps, but nothing works like Theraeworx for immediate relief. Bottom line: for $17 with a money back guarantee you can go wrong. So, get over to Wal-Mart or Walgreens and buy some. I'll try anything and everything to get rid of them. My new favorite sunflower seed is Spitz Dill Pickle Sunflower Seeds. They are so good that I'm not getting anything done around the house. I can't stop eating them! Here's an update on the post below. It's been a year now since I got these pans and I must say that I am still impressed. The Tramontina 12", as inexpensive as it was, is holding up like a champ and has lost none of its antistick ability, despite a good bit of use and many washes in the dishwasher. I highly recommend this one if you want a good nonstick pan. The Henckle's is also holding up well and is just as nonstick as it was the day I got it. It cleans up like a whistle, too. I also highly recommend it, too. Well, I bought 3 new non stick pans. Two I got on Amazon, during their Prime Day sale. These were an 8" and a 12" Tramontina professional/restaurant series. Nice nonstick coating and aluminum casting. Pretty slick and dishwasher safe. Have to see how they hold up over time, though. The other pan was one that just popped up in my Facebook feed as a review piece from one of the gourmet mags. It is an 8" J.A. Henckle's Madura Plus and it is slick as all get out. No rivets for the handle to make cleanup harder. One solid cast piece. Really nice surface, doesn't even need any oil. Sadly, not dishwasher safe and only good to about 300 degrees in the oven. Still in all it is a great pan and cooks very well, nice and hefty and distributes heat better than the Tramontina's. The price was very good, too. If you need a new nonstick stop in and get one. Amazon and Amazon Prime are great, but for incidental, small items Wal-Mart is fantastic for incidentals not stocked locally. In recent months I have purchased two bottles of Scott's Barbecue Sauce, two jars of Mezetta's Sweet Bell Pepper Relish, and a gallon of Spray-Nine. The TOTAL for this treasure trove of goodies not available in Dallas was <$20.! Had I ordered the stuff online from Amazon or the manufacturers the tab would have been $80. or so. Wal-Mart prices with no freight sitting where I visit for other stuff twice weekly. Sadly, they have not started offering Reymer's Lemon Blennd yet. But, I'll bet that all I have to do is ask. In any case, the next time I need the 'old school' Cascade, they will have it for me to pick up, with no freight. Ah, yes. There it is. So, I was excited to find it available within a short drive from us, rather than the hour away where I first discovered it. If any of you live near an Another Broken Egg Café, you MUST try this stuff. It is a bit 'spicy', but hot what I'd call 'hot'. It is simply divine on pork chops, pork loin, etc. And it is also great on those ever-present but otherwise bland rotisserie chickens sold in grocery stores, COSTCO, etc. That's the Plantation brand? That label isn't very telling. My go to lately has been Cholula. It has good flavor. I like Cholula, too - especially on hash browns. But, the sauce above is nothing like it. It is unique, bottled under private label for the Another Broken Egg Café restaurants. Aha! Private label. Explains not being able to find it. As soon as I discovered that they had a location more convenient to us I called to confirm that this location, ("only" 21 miles away via freeway), offers it for sale. Then I posted about it on two threads here. Mrs. Metro and I will be going there for breakfast this morning. On the way home I'll be picking up some stuffed porkchops for dinner and a rotisserie chicken for tomorrow's lunch! And, per a suggestion from Root-Beer Man,I'll also shop for some Pickapeppa Spicy Mango sauce for a comparison. I'll "report" pricing and online availability (if any) later this morning. 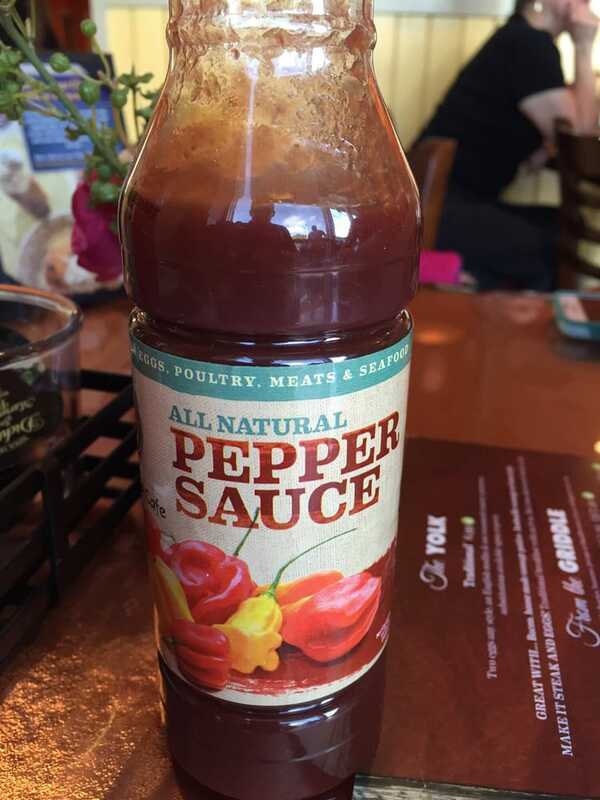 Another Broken Egg Cafe's Plantation Pepper Sauce is $5.95 for 10 oz. The manager did now know anything about availability online, but I would have to imagine their corporate offices would accommodate an order: E-Mail them here. I did find Pickapepper's "Original" Sauce which does list "mango concentrate" as one of the ingredients. It was $3.95 at Central Market for 5 oz. Comparing the two, I'd say that they are definitely in the same family - cousins, perhaps. I like the Pickapepper and the stuff from Another Broken Egg. I will check other groceries for their Mango variant. It's available (kind'a) near you over in Burbank. EDIT: And BTW, we really enjoyed their food this morning; sauce aside, it's now on our short list of "go to's" for breakfast. Interesting! I looked them up yesterday and it looked like Texas was the closest. Another restaurant that is open only until 2pm. You do know that I'll go there, I just don't know when. I made a U-Turn on Hwy 111 yesterday because I thought I found it. What I found was The Broken Yolk. Mrs. Metro wanted a farmer's sink. I found this one at Costco for $199. It is manufactured in Australia and is equivalent quality to others' selling in the $500 - $600 range. So much more functional than the double sink it replaced, it is the value of the Century! EDIT: 12/24/2018 -- I see that the Costco 'Black Friday' $199 deal on this sink/faucet combo is over. It now sells for $299. And, it remains worth every penny of that 'regular' price! Since, I have seen faucets-only of that design selling for $300+! Nice! I've seen some affordable ones in similar styles at IKEA. Both my wife and I would love to have one. Until very recently, these cost $500+. 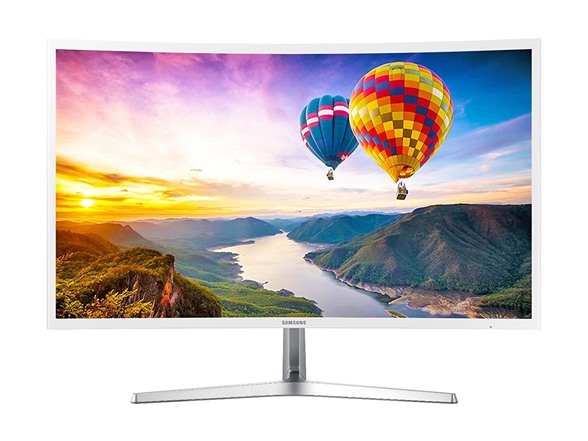 Now, however, as the 4K models are coming out the price has dropped like a rock. I got mine from Costco for only $179 - 10 bucks less than my 23" HD monitor I got two years ago! BTW, for those of you who are still using a display with the old "harness" hookup, check to see if your display and computer have HDMI ports. If so, get a 10 buck HDMI cable and toss the harness; you'll be AMAZED at the improvement in clarity. Speaking of TVs. I was passing thru a TV section a few days ago, and a 48 +-in model caught my eye. It makes "ordinary" TV broadcasts into HD. It showed a small section of the screen with pixils that you could see turned into photo quality. I said to the guy next to me "That is amazing! ", and he said "More than you know". He works for Bose, a local speaker company, "But I wish that I got to work there". He said that "Thinking" computers are now the norm, and cheap. He said that the TV we were looking at had more computing power than every computer in the world had, put together, just 50 or so years ago, before some IBM model number, that he mentioned, came out and changed everything. The "similar items" bar at the bottom of the page has this Kohler sink package, but the price is shown only after logging in. Perhaps the server needs to check to see if the user's computer can handle a number that large. Does this 'new technology' somehow augment present 1080p broadcasts to appear as 4K for viewing? That would be some trick; to do such augmentation in real time would indeed involve 'super computing'! Indeed, technology is now advancing at "warp speed". Take TV's. I bought my first color TV to "celebrate" the Steelers' first Super Bowl appearance in January of 1974. That 19" Zenith cost me $400 at a time when I was taking home $900/month! Every TV since has taken an ever-smaller 'financial sacrifice' as a % of my monthly take-home. Replacing a then 'state of the art' 60" Sony (that needed a new $500 lamp every other year!) I had purchased in 2006 for $3,700, my present TV is a 65" Sony UHD-4K that I bought in 2015 a year after they came on the market for 'only' $2,300. That purchase was a little 'too soon' as well; I just saw a Vizio with the same specs for $589 at Sam's Club! It seems that display technology has advanced more quickly than broadcast/cable/satellite programming. I have yet to enjoy any 4K programming even though I paid for the capability to receive it three years ago. So, does this 'new technology' augment the present 1080p broadcasts to appear as 4K? Indeed, that would be some trick; to do such augmentation in real time would indeed involve 'super computing'! That has to be pricey. I think I'll wait for the Holo-Deck! I went and looked for some reviews on it. Seems like a normal "As Seen On TV" item, (ie; won't do as well as old time tech like a whetstone). It's not really a "sharpener", by all accounts, it's a honer, like a steel. As long as it's not peeling off metal from your knives, (as so many of these miracle sharpeners do) I'd say you're OK. Just don't look for it to perform like it does on the infomercial. Best bet for knife sharpening is to check locally for knife sharpening services (weirdly enough, I have often seen JoAnn's Fabrics stores offer the service, and at a good price, too!) . Once they're sharpened just use a steel every so often and avoid the usual dulling activities. Just my opinion as a knife making hobbyist. $279, but it's not a farmer's sink and does not have the magnetic faucet. The credit card demo starts 2 minutes in.